Color can enhance the vitality of the body and restore balance to it. The effect of color is not only visual, a color’s vibration penetrates the skin and works on the organs as well. This is how color promotes self-healing and vitality. For example, if you are suffering from insomnia, blue is good for you. Use it for bedspreads or pajamas, or visualize the color when you go to bed. However this color is not recommended for people whose hands and feet get cold easily. If you are prone to fatigue, good to use pink or green or beige in your bedroom. These colors are less likely to tire the body , they even relax it. Conversely, when you want to be active, good to wear clothes or use things that are red, orange or yellow. ------ Choose the color which you feel the most comfortable with at the time. Orange flowers and clothes, and gold jewelry and sunbathing are all good for people who have been hurt in love or who are slightly depressed. These colors improve blood circulation and stimulate the brain. Moreover , they relax the intestines and energize the mind and body. Orange and yellow are also good for people who tend to suffer from constipation. How about using yellow and orange bathroom accessories ? As mentioned above, we can try using colors to solve problems. What color are you most attracted to at the moment ? We are drawn to a certain color because our mind and body need the energy of that color and because we want to be in sync with it. Color can also show your personality based on what color you like the best. Based on which color of your clothes, you want to wear in your daily life , it can show your mood, what is in your heart deep inside . However, people who are attracted to the color red may not always be feeling active or energetic themselves. Some of these people are in that state of mind , but not all of them. Some are drawn to red because they need its stimulus -- something that they don’t have enough of in their daily routine. 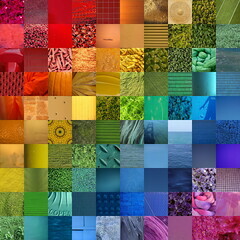 Color is also closely connected to memory. You may be drawn to red because of your memories. For example, a time in your life when you used to wear red clothes may overlap with your current emotions. The human mind is complex, and unlike in math, there is more than one answer. Colors can have many meanings, and the meanings are often ambiguous. The important thing is to be aware of the color you are drawn to and of the changes in your feelings. By doing so, you will be able to understand your emotional cycles better. For example, if you notice that you tend to wear a black dress when you are tired, you should think about getting more rest. In addition, to stay balanced in mind and spirit, it’s important to have a variety of colors in your life.